Microgaming invites players to enjoy a truly remarkable gaming experience that is all about diamonds and gems, which explains the name of the game and it also succeeds in explaining the huge number of shiny gems and precious stones that can appear spinning on the reels of the game. The reels’ symbols include blue sapphire stones, green emerald, red rubies, golden stones and poker card symbols that come in shiny and bright designs to be fitting to the theme of the game. The game also comes with a soothing and a relaxing soundtrack that players can hear in the background while enjoying the game. 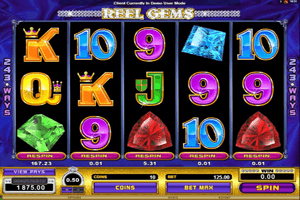 Play Reel Gems Slot here. Reel Gems is a 5-reeled video slot machine that offers players a total of 0 lines that they can place their stakes on, this is because the game has the higher paying format, the 243 ways to win format. This means that players will have many chances of winning whenever they spin the reels of the game after placing their bets. Players can place the stakes they want through the control panel of the game which is found at the bottom of the reels. The control panel includes the different options that players can go through, they are the value of the coins and the number of coins as players can place from 1 up to 10 ten coins. The game has a free spins round, a re-spin feature, a wild symbols and plenty of high paying regular payouts that players can earns by getting matching symbols, which rewards players greatly.